September 14, 2018â"A range of issues relevant to health in both Thailand and the U.S.â"including medical education, maternal health, hypertension and stroke risk, and the role of policy and persuasion in changing health behaviorsâ"were discussed at a recent symposium aimed at promoting connections between the two countries in public health and medicine. 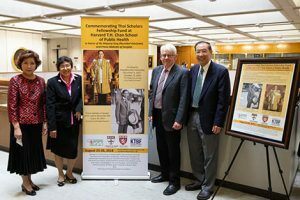 The two-day symposium, held August 22-23, 2018 at the Francis A. Countway Library of Medicine, also honored the contributions to public health of Thailandâs Prince Mahidol of Songkla (1892â"1929) and his son, King Bhumibol Adulyadej (1927â"2016). More than 70 attendees from the U.S. and Thailand attended the event, which was co-sponsored by the Harvard T.H. Chan School of Public Health, Harvard Medical School, the King of Thailand Birthplace Foundation, and the Thai Physicians Association of America. 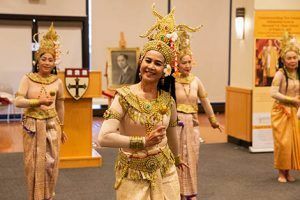 Cholthanee Koerojna, president of The King of Thailand Birthplace Foundation, opened the event and summarized the abundant connections between Thailand and Harvard University during the last century. Joseph Brain, Cecil K. and Philip Drinker Professor of Environmental Physiology at the Harvard Chan School and a member of the event organizing committee, said the symposiumâs attendance, especially the many who had travelled from Thailand, was a testament to Thai commitment to the legacy of Prince Mahidol Adulyadej and King Bhumibol Adulyadej. Prince Mahidol of Songkla was one of the earliest alumni of the Harvard University and Massachusetts Institute of Technology School for Health Officers, which would become the Harvard Chan School; he received a Certificate of Public Health. He also received an M.D. from Harvard Medical School. He left a career in the Siam Navy at age 27 to study public health and medicine and to promote them in Thailand. While in the U.S., he negotiated an agreement with the Rockefeller Foundation to provide funding for education in medicine, nursing, and public health in Thailand. Upon his return, he served in the Ministry of Education and presided over substantial upgrades to science and medical facilities in Thailandâs universities. During a reception following the symposium, Mike McNally, Vice Dean for the Office of External Relations, announced the launch of a new Thai Scholars Fellowship Fund. The fund is intended to strengthen the relationship between the Harvard Chan School and Thai scholars by providing financial support to students for tuition and fees. The symposium featured more than 20 speakers, including many experts from Thailand, other universities, Harvard Medical Schoolâs Edward Hundert, and Harvard Chanâs Nancy Long Sieber and Edward Nardell. Prem Chantra of the Thai Physicians Association of America (TPAA), Cholthanee Koerojna of the King of Thailand Birthplace Foundation, Joseph Brain, and Usah Lilavivat of TPAA.